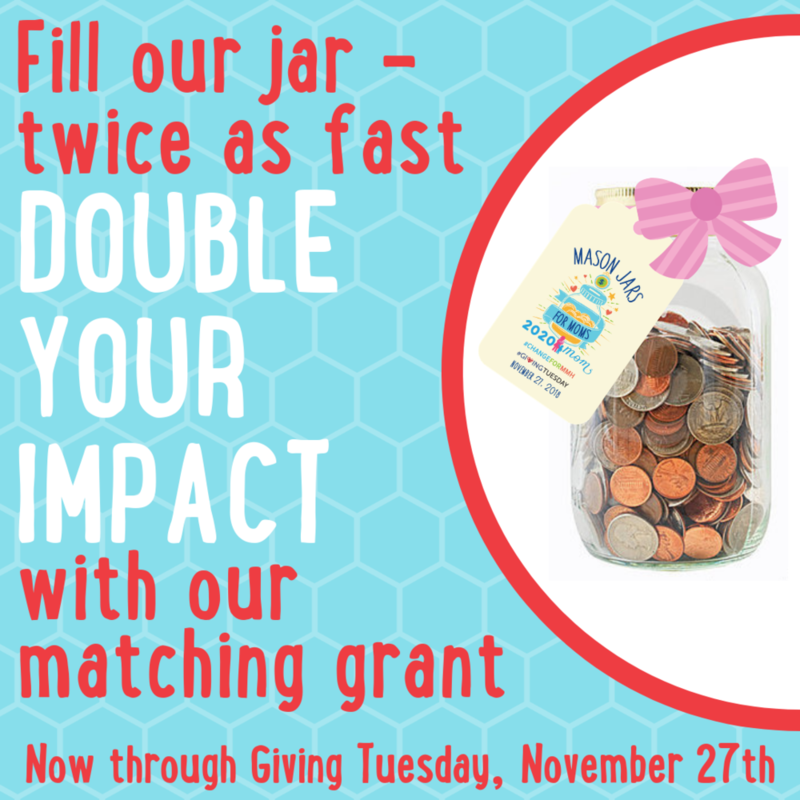 Mason Jars for Moms was the theme of 2020 Mom's #GivingTuesday and year-end fundraiser. We asked those who have been touched by 2020 Mom's efforts to close gaps in maternal mental health care, consider making a donation anytime before the end of the tax year, December 31st. Where will this money be used? 2020 Mom's mission is to close gaps in maternal mental health care through education, advocacy, and collaboration. These funds will support 2020 Mom's state and federal legislative advocacy work, which can not be funded through grants. We count on your gifts to aid our efforts to make a significant difference in the lives of U.S. families. Our social media campaign included reaching 65,427 on Facebook. The first way was to use a Mason Jar of your own. Fill your jar with loose change you acquire in your daily shopping or may have around your home. You can get your family and community involved by asking others to help fill the jar. Take your jar to your local bank and see how much you were able to collect. Make sure to record and/or take a picture when you take your jar to your bank and post it on social media using #ChangeForMMH. The second was to help 2020 Mom fill our Virtual Mason Jar by making a donation. The third was to start your own fundraiser to fill your virtual jar. Combine forces to create an awesome team. Together we can raise more for 2020 Mom than we ever could alone! Total Funds Raised: $8,766 for the Mason Jars campaign, with an additional $2,319 through the 2020 Mom standard donation page, for a total of $11,085.